10 Pieces of assorted Animal Mats. These mats are 12”x12”x1/2” per piece and can be used as flooring or to make big soft lego blocks. The pictures punch out and can make a great soft puzzle for kids. 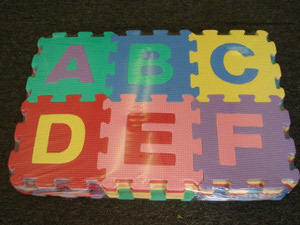 These will fit with the Alphabet (MA-AL1226) and Numbers (MA-NB1210) along with Standard 24”x24”x1/2” and 12”x12”x1/2” mats. 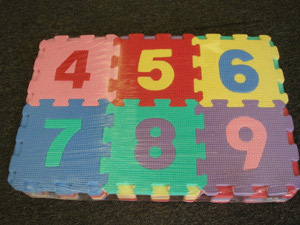 10 Pieces of Numbers Mats. The numbers included are 0 thru 9. These mats are 12”x12”x1/2” per piece and can be used as flooring or to make big soft lego blocks. This is a great learning tool for kids. The pictures punch out and can make a great soft puzzle for kids. These will fit with the Alphabet (MA-AL1226) and Animals (MA-AN1216)) -- along with Standard 24”x24”x1/2” and 12”x12”x1/2” mats. 26 Pieces of Alphabet Mats. 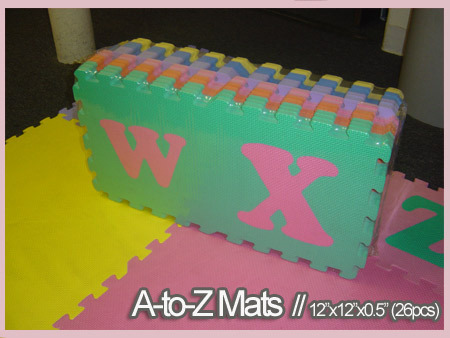 The set includes letters from A-Z These mats are 12”x12”x1/2” per piece and can be used as flooring or to make big soft lego blocks. This is a great learning tool for kids. The pictures punch out and can make a great soft puzzle for kids. 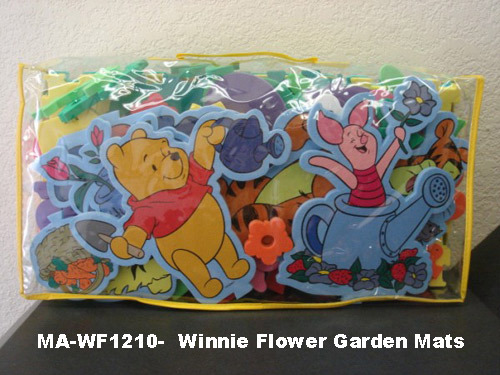 These will fit with the Numbers (MA-NB1210) and Animals (MA-AN1216) – along with Standard 24”x24”x1/2” and 12”x12”x1/2” mats. 36 pieces including A-Z and 0-9. These are smaller squares at 6”x6”x1/2”. These letters and numbers all punch out as well. They are suitable as a puzzle toy for learning! These do not fit with any other sets of mats. Hopscotch game for kids! 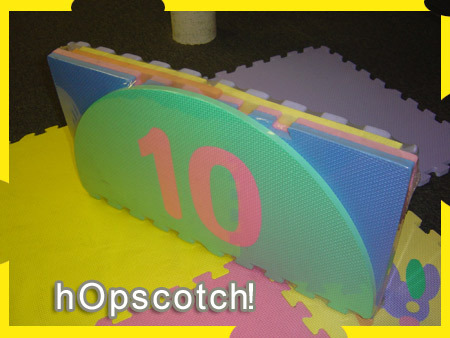 The game includes two marker pieces along with the traditional layout for hopscotch. The numbers punch out as well. EVA Foam tiles -- 8 pieces of 12"x12" with holes. There are 68 pcs total in the set. You can lay the mats on the ground and plug in the flower pieces on top. Winnie and Piglet joins you for some fun! Be creative with the pieces and laythem out how you want. Kids will enjoy playing with these. You can stick these on the wall as well or anywhere you see fit. 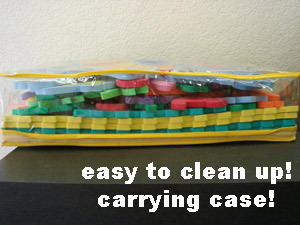 Easy to clean up and comes with the nice carrying case to keep all the pieces in. 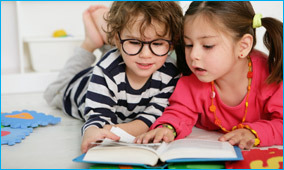 We have a selection of Kids Mats products that are superior in quality to other vendors. Our Kids Mats are made from the same high quality dense material like all our other mats. These kids mats are all 1/2" thick and provide great cushion for your little ones. 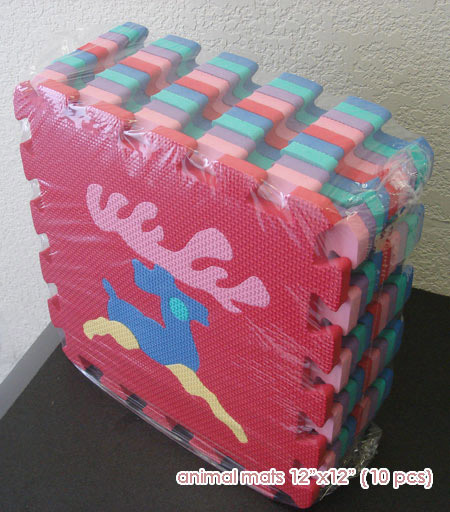 These mats can be used as soft legos building blocks or used to cover the ground. You will be very happy with our kids products.